The short-lived partnership between the Velvelettes and Norman Whitfield – both prodigiously talented, both far down the Motown pecking order – produced some very fine records, a run which continues here with another striking experiment. Back in 1962, Smokey Robinson and Mary Wells had formed the first great Motown alliance between a writer-producer and an artist, Mary finding her career “assigned” to Smokey. In a model that would serve Motown throughout the Sixties, Robinson was encouraged to write and produce hits for Mary, the two working closely together on the material, on the understanding that this arrangement would continue for as long as the hits kept on coming. The result was a body of work which stands up fifty years later, not just because of its quality but also because of its recognisable, individual sound, Smokey careful to keep giving Mary and her fans more of the same. The sound in question was a kind of midtempo, calypso-influenced R&B with strong hints of blues and pop, a mix which suited Mary’s slightly husky contralto down to the ground. On records like The One Who Really Loves You, You Beat Me To The Punch, Two Lovers, Your Old Stand By and What Love Has Joined Together, Mary and Smokey together refined the art of the sultry R&B calypso pop ballad to the point where there didn’t seem anywhere further to take it. Obviously, Norman Whitfield being Norman Whitfield, he seems to have interpreted this as a kind of gauntlet being thrown down. He cut a new song with his own version of that sound on Freddie Gorman (one of Whitfield’s earliest Motown productions), saw it duly shelved, and then remembered and dusted off the song (and backing track) two years later for his new pet project, the Velvelettes. So, what we have here is Whit and the Velvelettes doing their own take on the Mary/Smokey concept; the time when this stuff could top the charts was already past, but that doesn’t seem to have bothered any of those concerned. They’re doing this just for the hell of it, just to show that they can. And they can. Lead singer Cal Gill was still only just seventeen, and yet once again, you’d never guess it from her performance here. 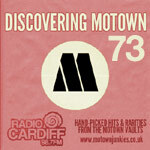 “I transitioned to a more seductive style, with encouragement from [Whitfield]”, she says in the liner notes to The Complete Motown Singles: Volume 4 (where this is the very final track of the collection, incidentally, making the title particularly appropriate). She’s excellent, as always, from her opening mmm-hmmm!, through her sultry readings of the verses (“I won’t be selfish boy, I’ll just set you free”), to her pronunciation of the word kiss in the title, which forms part of the song’s remarkable hook. Oh yes. Whitfield and the Velvelettes weren’t satisfied with just doing a Mary Wells pastiche, they sought to improve on the recipe. For a start, it’s a group record, not a Cal solo effort, and so the other Velvelettes’ added harmonies and shoo-doop shoo-doops are a welcome addition to the mix – but the real leftfield experimentation is to be found in the song’s very structure. The song opens with a sparse, slow three-note guitar sting in a strange time signature, followed by a vast ocean of dead air punctuated only by some distant taps on a woodblock, such that the listener is already thinking “what is this?” after just a few seconds. The record then blossoms into its lovely tune for the verses, Cal and the girls doing their thing in very pretty fashion, but when we reach the chorus and Cal announces she’ll “throw you a… KISS”, everything falls away, and we’re left alone with that weird guitar sting again, just three eerie, stabbing chords, and the girls’ acapella harmonies passing along the torch of the earlier beat in case we forget where we were. It’s remarkable, not just because it sounds so arresting, bringing a sweet little ballad up into the realms of fascinating records, but because it’s such a brave decision: the fruits of these people not being more famous, and thus being free to take such rewarding risks. And it is rewarding, meaning the song stays in your mind long, long after it’s finished playing. The Velvelettes, for those not paying attention, are a great, great group, and this is another excellent record. That their greatness has been all but forgotten (even by Motown fans) is a travesty, and it’s something I hope to put right here on Motown Junkies. Who’s with me? My first encounter with the Velvelettes, I think, was the purchase of the 45 ‘These Things Will Keep Me Loving You’ in a second-hand shop; similar searches led me to ‘A Bird in the Hand’, ‘Lonely Lonely Girl’ and then, at last, to this two-sided glory. I suspect we’re all with you, Steve.. Intoxicating and haunting stuff. Warm and wonderful, both the song and the review. Kisses to The Velvelettes, but never in farewell. Miss Ross may be ascending to the Queen of Motown at this point, but without all the wonderfully talented and hard-working other ladies at the company we wouldn’t remember the banquet of the Golden Years nearly as fondly as we do. Normally, I rate higher than you. But, I’d only give this a 7 on a good day, and a 6 on a bad day. It’s a nicely sung song, well written and an average Motown instrumental (which means very good). But a 7 is a very good song. An 8 is above average Motown (which means very, very good). A 9 is excellent. A 10 is “flawless” and classic. There’s an excellent version of this (the original, I’m guessing?) by Freddie Gorman on the Motown Unreleased 1962: Guys Vol. 1 download compilation – it appears to use the same backing track. It’s not mentioned in Don’t Forget The Motor City, and it seems to have been removed from the putative “liner notes” (writer/producer credits) to the Unreleased 1962 sets available on classic.motown.com, so … does anyone have any further information? We’re all with you. And we will forgive the Temps their version of this classic.